Montmeló, Spain – May 24, 2018 – Coming off of a pair of hard fought top-ten finishes in Round 1 of the RFME PreMoto3 Championship, Canadian rider Jonathan Finn is eager to better his results this weekend at Circuit de Catalunya. 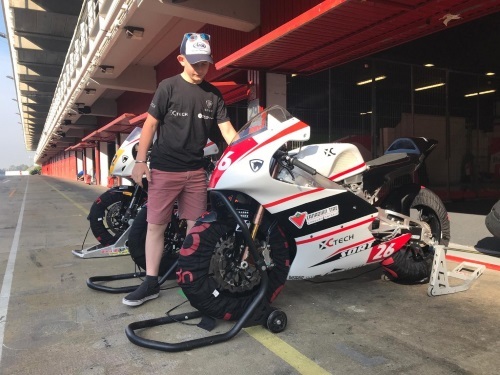 Finn tested at Circuit de Catalunya last weekend in preparation for the second round of the 2018 RFME Campeonato de España de Velocidad Pre-Moto3 championship. Although he had to battle the threat of rain throughout the test, Finn and the XCtech team were able to work on the set up of his #26 Team XCtech Canadian Tire – Cobourg machine in preparation for this weekend’s race at the 4.65km – 16 corner circuit. Finn is thankful for the support from Canadian Tire – Cobourg, Arai Helmet Americas, Bickle Racing, Human 2.0, Impact Safe-T Armor, Marsquest, BigB Racing, VNM Sport, Infinet Motorsports and Vroom Media Ltd.